What's so special about this layout is the different line-numbering on the left and on the right. 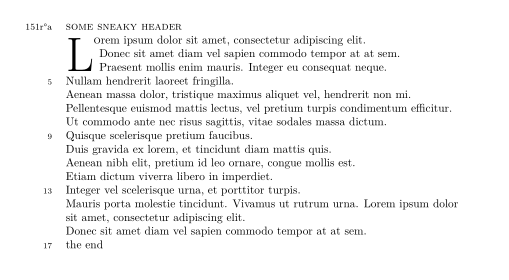 The left numbering counts the lines on 1 column of the original manuscript. The first line on "page 20r, column a" is 1, the last line on "page 20r, column a" is line 40. As you can see on 20rb (which is the second column) the numbering on the left is reset and starts again from 1. The line-numbering on the right, however, is continuous and counts the amount of lines the whole fragment consist of. When starting a new text in the manuscript, that number would also be reset to 1. Mauris porta molestie tincidunt. Vivamus ut rutrum urna. 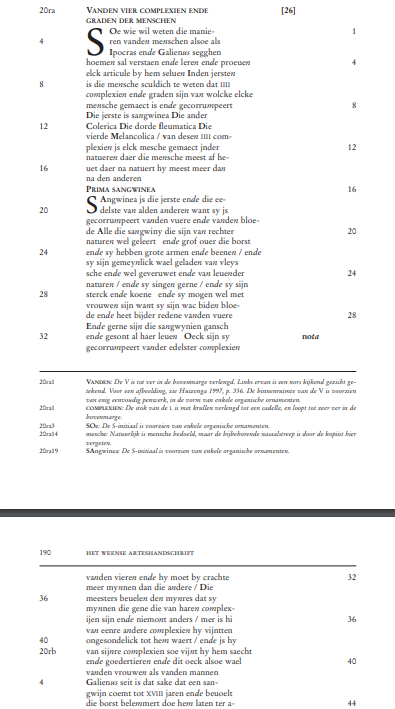 the numbering on the left in my MWE does something weird: it first counts to five and then displays every fourth line. is it even possible to get a different (contentiously) kind of number on the right hand side? Browse other questions tagged numbering line-numbering reledmac lineno or ask your own question.